A worm-free Karen in Western Samoa. After eighteen months on the island, the family felt like they could use a change of scenery. In Detroit, Larry would have just piled everyone in the car and taken off for a weekend drive to a nearby interesting place. After all, Flint, MI was only 130 miles away! But if you already lived in a paradise that happened to be in the middle of the world’s largest ocean, the choices were limited. They decided to visit Western Samoa, which was not only NOT on their island of Tutuila, but was also an entirely different country. Owned at various times by the Germans and the British, the islands declared their independence in 1962 and were now attempting to try their hand at governing themselves. Being your own boss can be a giddy feeling, and the government has made some bold choices, most of them in the past twenty years or so. In 1997, they amended the constitution to change the country’s name from Western Samoa to simply Samoa. This pissed off American Samoans, who asserted that the change diminished their own identities in whatever the Samoan translation of “what are we, chopped liver?” would be. The people of American Samoa still use the terms Western Samoa and Western Samoans to describe the independent state and its inhabitants, because they are not the boss of them. This change was unfortunately reinforced when the reality TV show Survivor filmed three different seasons there (2009) and blatantly put it on the show logo for millions to see. This was the season that introduced Russell Hanz to the general viewing audience, much to their dismay. Also in 2009, the government of Western Samoa decided to change the driving orientation for motorists: Samoans now had to drive on the left hand side of the road instead of the right as they had been doing for years. One can only imagine the chaos that ensued when a nation not known for its driving skills attempted this change. 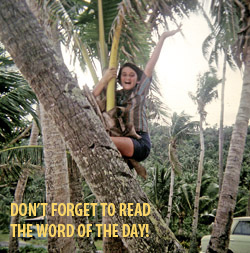 Finally, at the end of December 2011, in a move that only Marty McFly could understand, Western Samoa jumped forward by one day, omitting December 30 from the calendar and declaring that Samoa would now be west of the International Date Line instead of east. The rationale behind this was to help the nation boost its economy in doing business with Australia and New Zealand. Before this change, Samoa was 21 hours behind Sydney; now it is three hours ahead. Great for business, but a major bummer if your birthday happened to fall on December 30. But these wacky shenanigans were far in the future; Western Samoa had barely split from the British when the Broquet family decided to visit in 1965, and that meant that creamed cod on toast was sure to be on the menu. Since cruising on the sea seemed so civilized, Larry and Jean decided to book passage on a small ship. The four girls were the only children on board and had been properly threatened to behave themselves. We left Pago Pago at 6pm on the New Zealand freighter TSMV Tofua. I thought TSMV would stand for something romantic like Territorial Service Majesty’s Vessel, but it’s just an acronym for Twin Screw Motor Vessel. The freighter shuttles back and forth between New Zealand and the South Seas and besides hauling freight, it also has accommodations for 60 passengers. We had two cabins with three berths each, but unfortunately, one was already occupied by a young English lady. I was willing to share the cabin with her but my narrow-minded wife insisted I sleep in the other one with the kids. Somehow, I ended up sharing the berth with Karen. Glad her ringworm has cleared up. Maybe it’s just as well – the English lady smoked cigars (honestly). The dinner bell rang as the ship departed Pago harbor, but I was still panting from a frantic trip to a friend’s house about fifteen minutes before the ship sailed. Why the mad rush? You’ll never believe it. I was trying to borrow a TIE. I knew the British influence would be strong, but who the hell thought I’d have to wear a tie to dinner. Boy, was it ever British! The dining room was small but well-equipped with a baffling array of silverware as the family were seated at a reserved table. Kathy tried not to stare at the white-coated stewards who stood at attention, waiting to fulfill their every need. She gulped as one approached her and formally asked if she would allow him to spread her serviette. Carolyn kicked her under the table and Kathy blushed furiously as she tried to figure out how to respond to the question, having no idea what a serviette was. The day was saved when the steward barely nodded his head and relief rushed through her body as she realized he meant her napkin. This was going to be a very long meal. The dinner was delicious, with course after course of well-prepared food. As the last plate was cleared from the table, the intimidating steward returned carrying a tray full of delicious cheeses. It seemed odd that this was the final course as the girls were hoping for ice cream bars, but Kathy was confident that she had finally figured out the fine-dining code of what fork to use and how to navigate the confusing number of glasses on the table. She gave the steward a dazzling smile and reached out for the tray. There was a brief moment of tug-o-war as the steward seemed to pull back, but he finally reluctantly relinquished it and then walked briskly away. Kathy triumphantly put the tray down in the center of the table as her sisters each grabbed hunks of cheese and nibbled at them like mischievous mice. A few moments later, the same steward returned with another tray of fromage, and the lady at the next table delicately helped herself to one small piece of cheese. The tray now sitting in the middle of the Broquet table had been for one half of the dining room, and the term “Ugly American” became just a little more true.